To ease my worries over the cooking chores, I decided to focus on the “novel” and “picnic” aspects of Novel Bakers Picnic Week. So, what is a picnic? According to the instant poll I took of my family, a picnic requires food (yes, they each listed that, because after all, they know me), prepared at home, put into some sort of container, and carried away to a scenic location. Mr. Fun emphasized that there could be no cooking at the picnic site, because then it would be a barbecue. 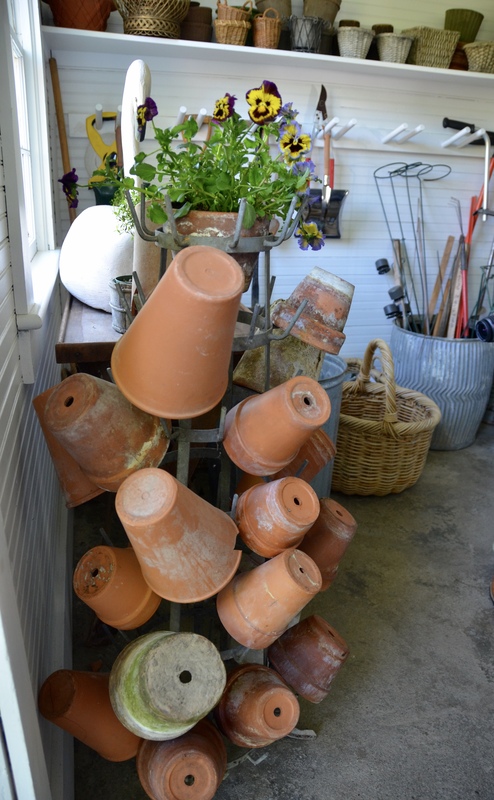 He was adamant about this and I suspect it was because he knows all outdoor cooking is his responsibility. 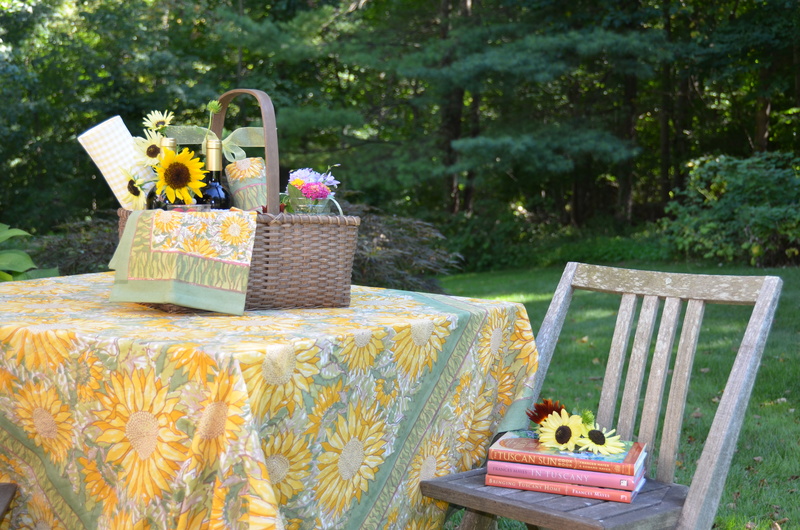 So, I rounded up all my picnic containers and compiled a list of interesting locations where we could picnic, read novels, and perhaps do a little summertime napping. Of course, we would need a fine beverage to go with our foods. 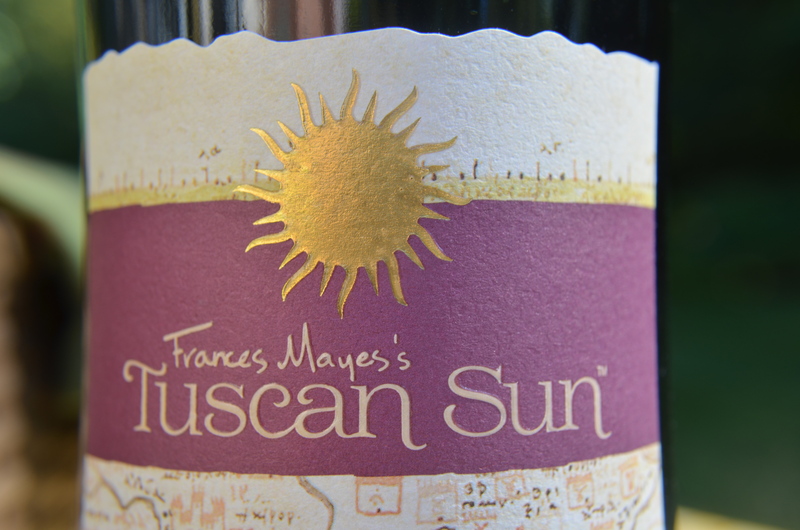 As soon as I read that one of our picnic themes would be Tuscany, I knew that my menu would include the new wines from Frances Mayes. All of her books are on my shelves, some very tattered from multiple readings. 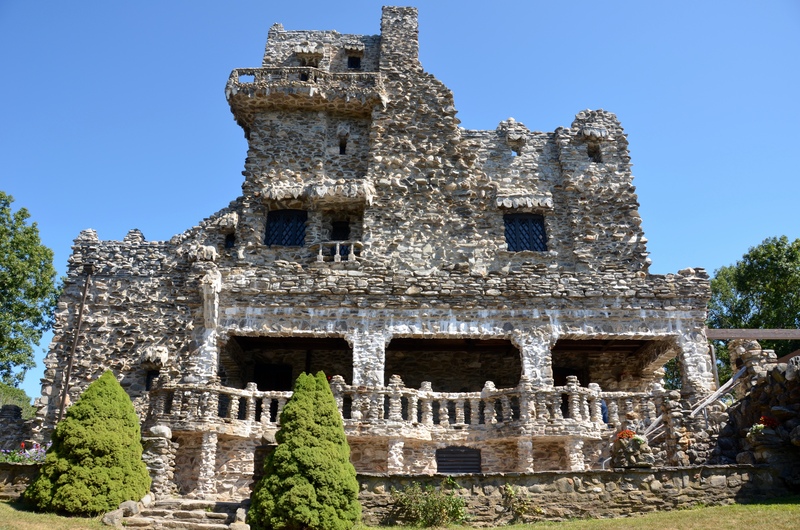 However, this is Connecticut. Not Tuscany. 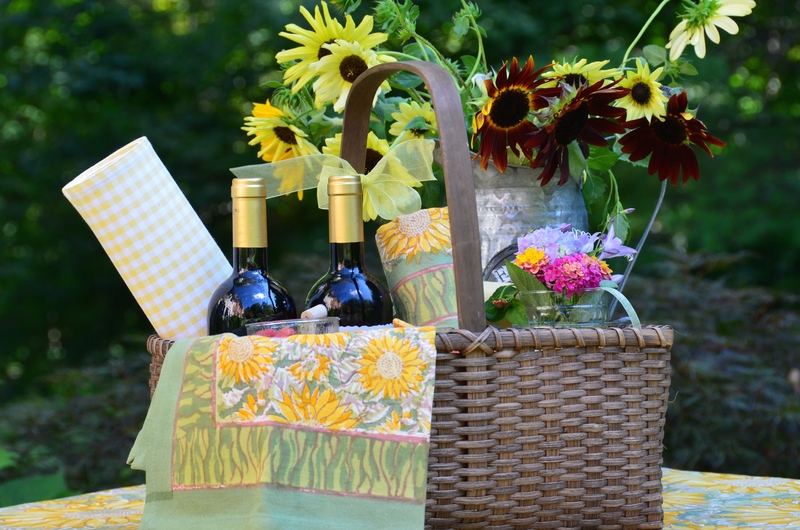 And as I found out first hand from a National Park Ranger at one of our picnics, a blog party is not justification for carrying wine, even unopened to be used as a photo prop, into a park! So, this picnic was prepared, packed, and carried in a basket out of our front door and into our yard, where we enjoyed it Under the Connecticut Sun. 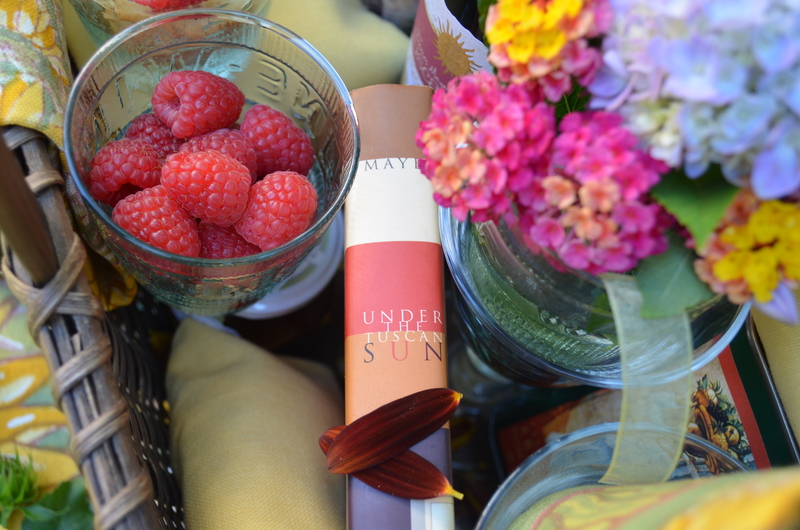 All the goodies went into my basket, including a copy of Under the Tuscan Sun (not the tattered one! 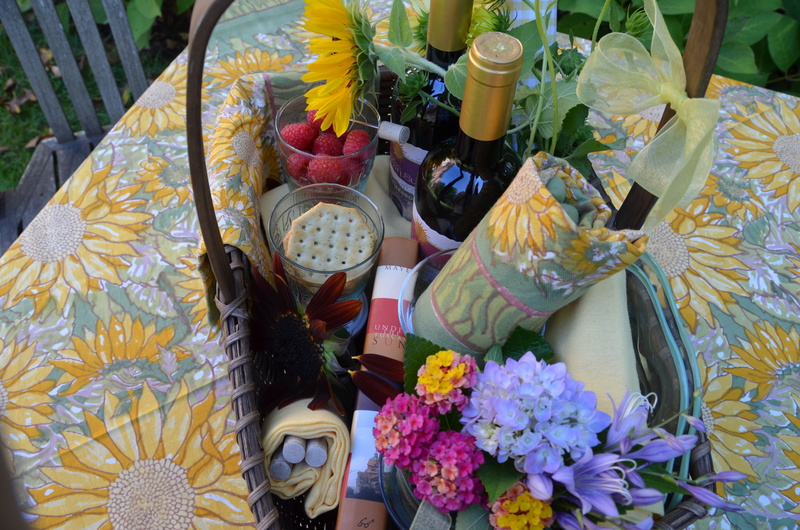 ), two bottles of wine, wine glasses, napkins, fruit, and flowers from my yard (yes, I know, but let’s pretend we went to a scenic and exotic location). Tiny sunflower petals were falling everywhere so I salvaged a few to dry for use as bookmarks. 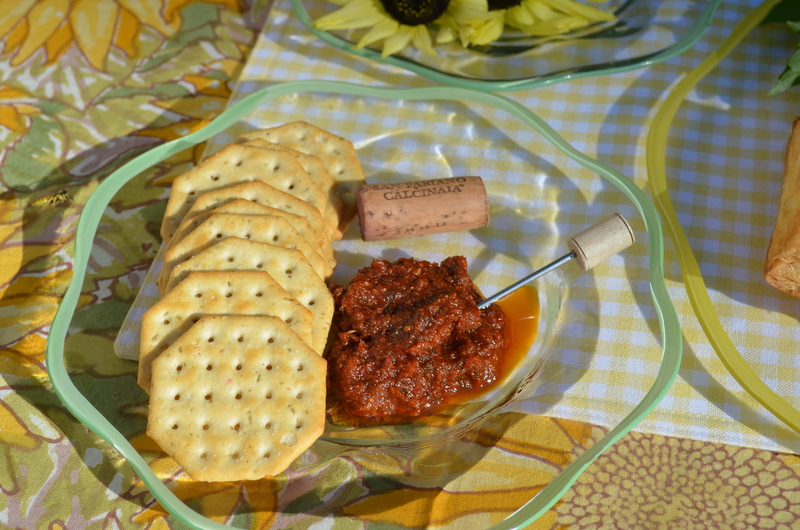 I’m always in favor of picnic foods prepared by someone other than me, and these rosemary crackers with a sun-dried tomato and basil spread were delicious! 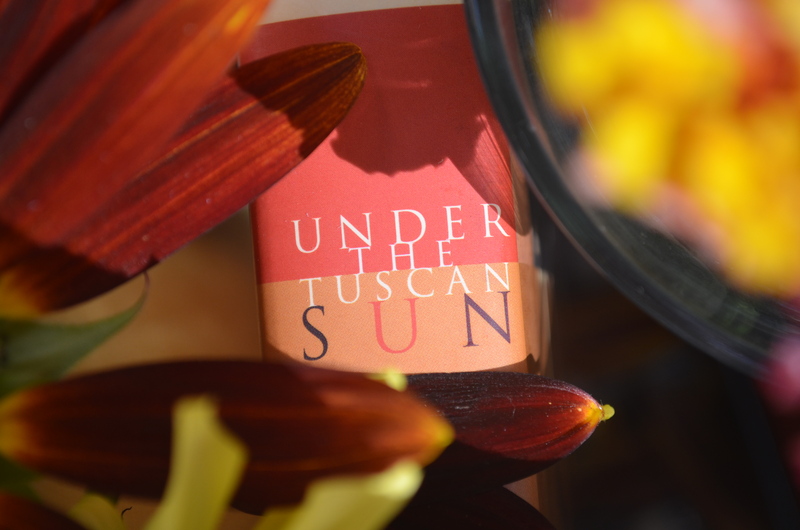 The Tuscan Sun wines all have beautiful labels, so if you are like me and buy your wines because they will be pretty on your table, these will all work for you! 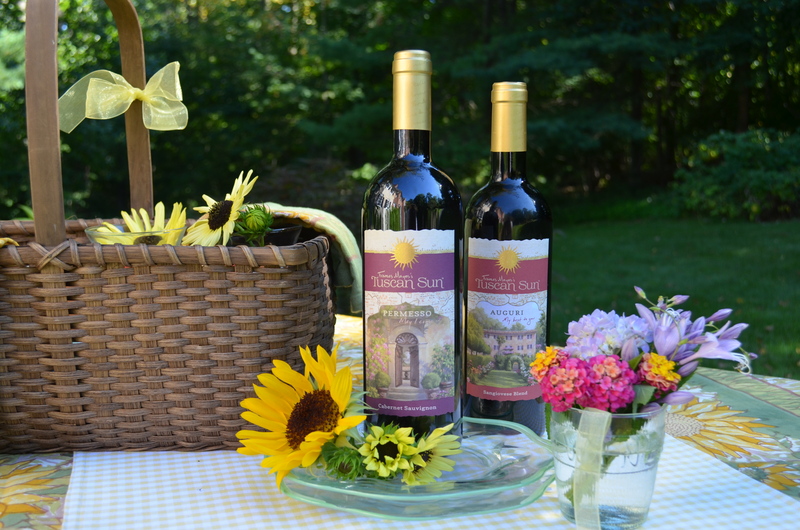 Each has a Tuscan scene painted in watercolor, with interesting tidbits on the front and back of the bottles. This Sangiovese Blend, perfect with appetizers, has a painting of Bramasole. 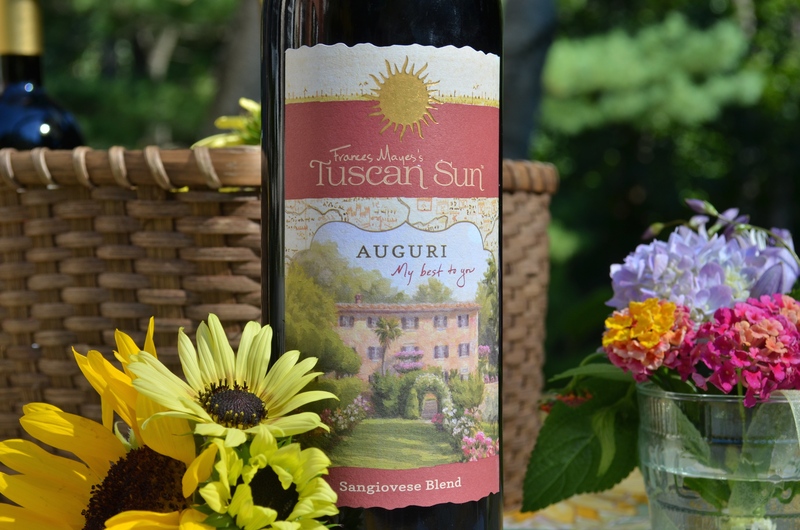 The Tuscan Sun wines will also be enjoyed by those of you who buy your wine because of the liquid inside the bottle and not just for the label. 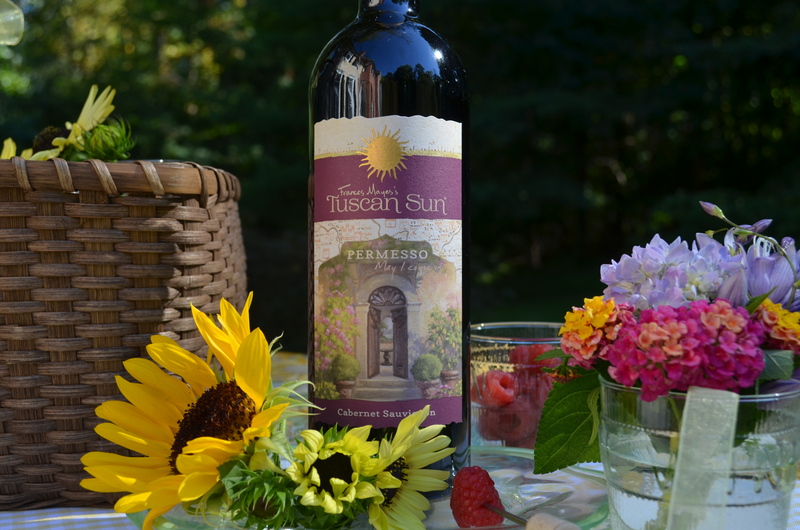 The Cabernet Sauvignon, Permesso, is wonderful, and the label has a door open to welcome us to a picnic in the garden. 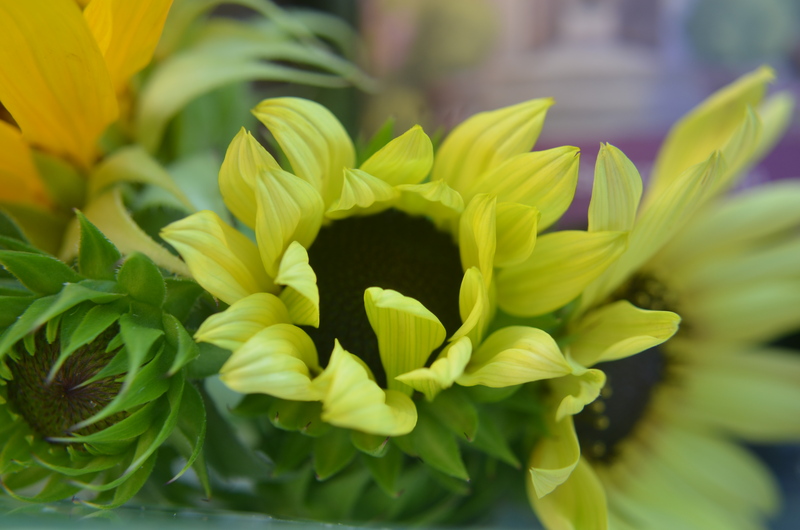 There are several other varieties, but they are difficult to find now! You can see them all here, including descriptions and views of the labels. While we sipped the Sangiovese I practiced my photography. With every sip my technique improved! 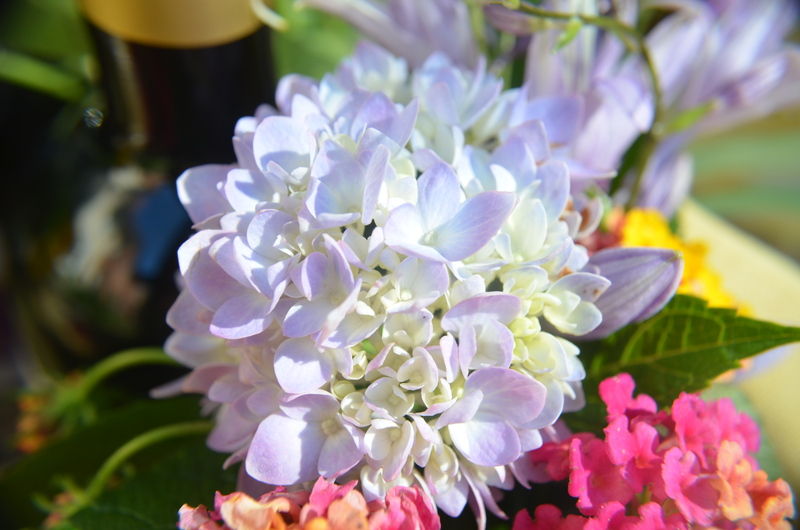 I have so few hydrangea this summer after last winter’s wrath, so this hardy one deserves its own closeup. 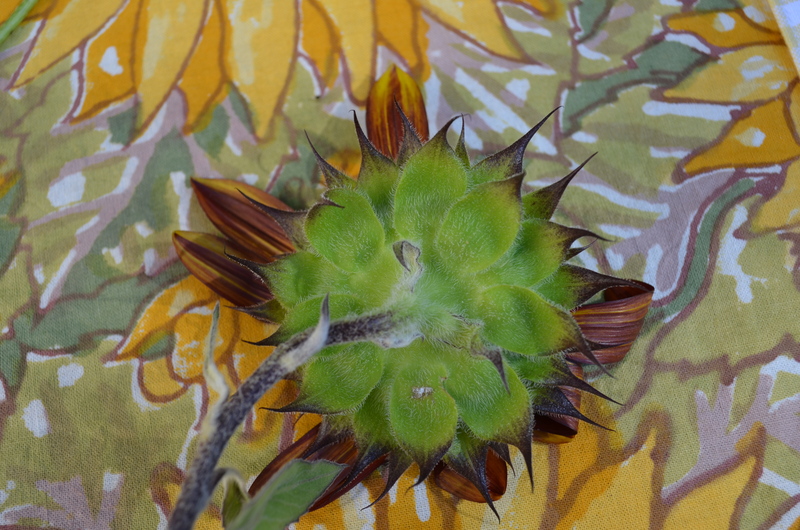 I was intrigued by the sunflower buds. 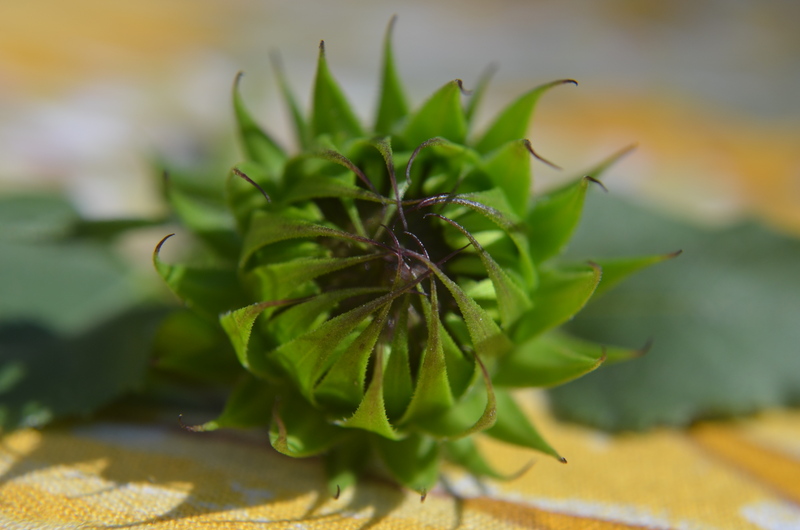 And amazed at the beauty of the other side of the flower. 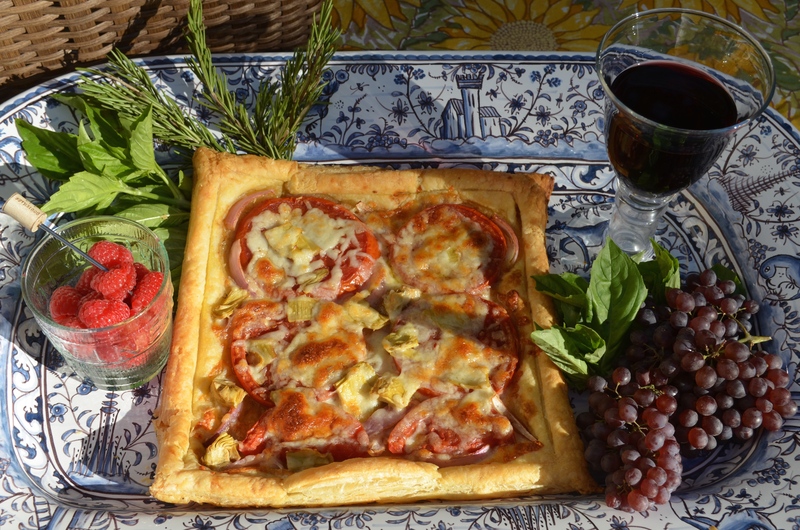 It was a perfect day for a picnic, with a few puffy white clouds in an otherwise bright blue sky, gentle breezes, and zero humidity, so I found a recipe for a puff pastry tart with buffalo mozzarella and beefsteak tomatoes in one of our Picnic Week cookbooks — A Perfect Day for a Picnic, by Tori Finch. 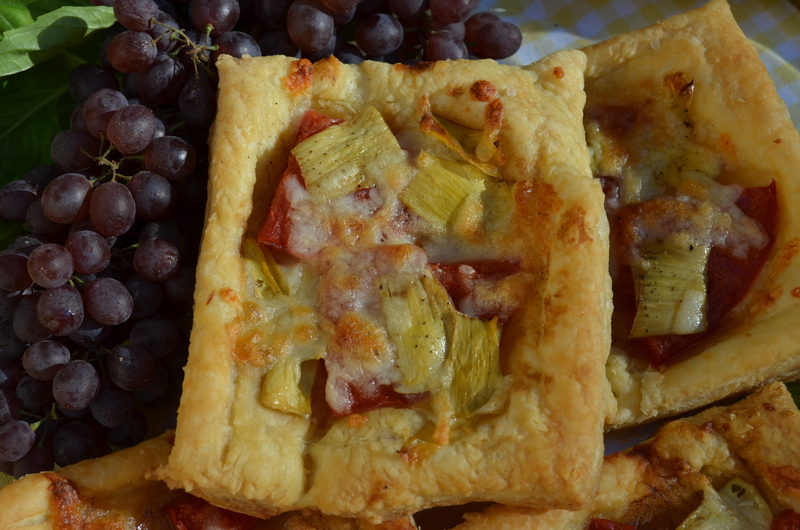 I made individual tarts with tomatoes, onion, garlic and cheese, and some with artichokes instead of onions. One large tart was loaded. 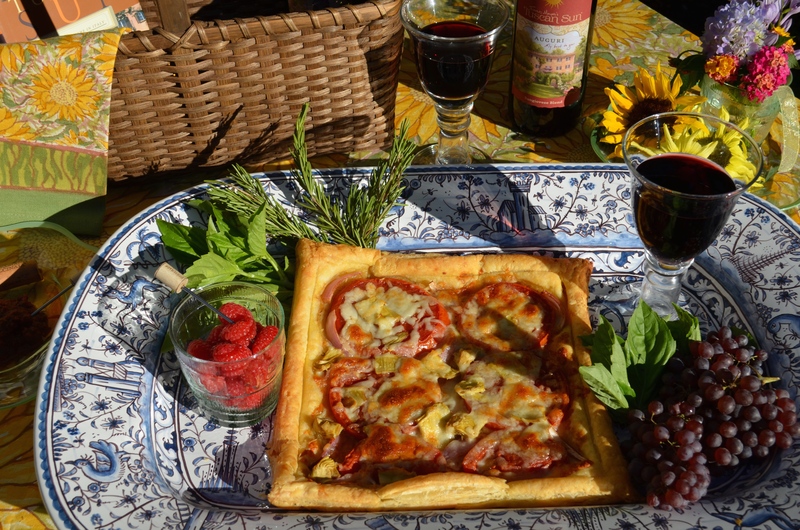 The tarts were delicious, and as I looked through this cookbook I knew I would be using it for many more picnics ideas on other perfect days! Ambiance is more important than food to me Linda, and with lots of flowers and beautifully labeled wine, a romantic setting, not to mention books to peruse, well, who needs food! Your tart however looks irresistible! 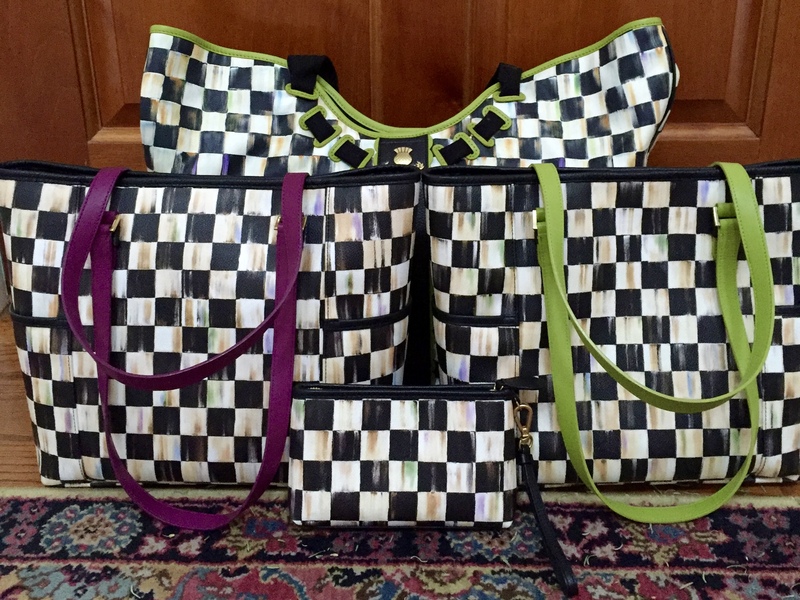 And perfect for your Tuscan picnic! Your candid comments are so much fun, you have created a most delightful picnic! oh i am so excited to see you play with us, totally cracking up if can cook this so can you! and about mr funs words of worry, as in precooked, no bbq for his shoulders to carry the brunt of the picnic! and wine/ranger story has me truly guffawing out loud! i have done so many things under the guise of a “photo shoot”, it truly makes you bold! the basket if brim full of fun, such vibrant tuscany colors… i am color starved on the coast, i love blue and green, but at home i understand there is a very full color chart just out of my reach here! you are right, such pretty bottles! 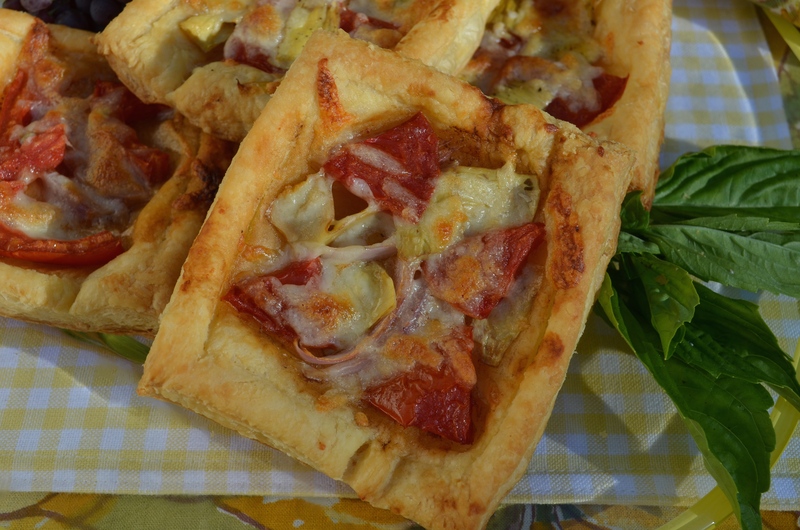 i made your same puff pastry! this is the part i hate… when others look better! 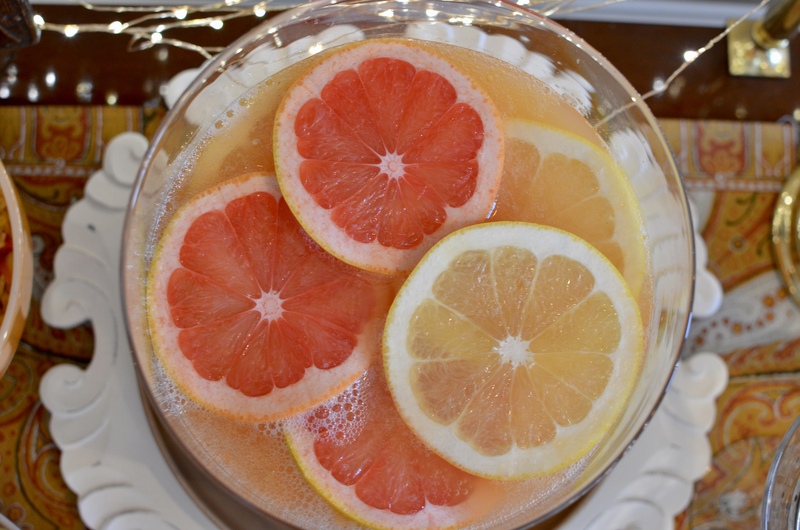 you jazzed it up or i have a different recipe, either way, yours looks and tastes better! oh what a delightful picnic, i am SO glad you joined in, your sense of humor is delightful, coupled with your drunken shots, its all just perfect! can’t wait to see what the rest of the week brings, do we get to see you in shake down with the ranger as you try and sneak in your bottles? 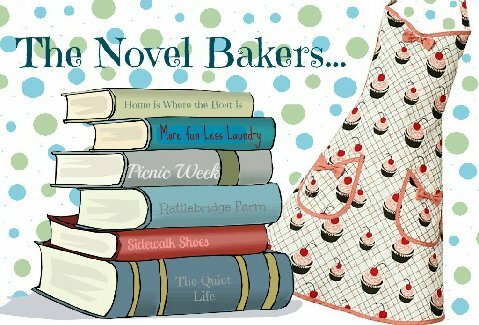 feel free to pin our group to our novel baker picnic board, i am running slow today, savoring everyones picnics, if i start to pin i will never get dressed for the day and be here until midnight! can’t wait to see the rest of your week, may we all eat drink and be merry! Hey, my photography improves the more wine I sip too! Well, I read one blog a little while ago that made me cry, and now I read yours and I’m chuckling and actually laughing, Linda (the photography skills improving with each sip). I’m here because Maria at Dreams and Epiphanies wrote about your romantic table that inspired hers, so I just had to visit, and I’m so glad I did. I didn’t know about Frances Mayes’s wines, but I MUST have some of them (the bottles, I mean 🙂 ). Yes, I too, buy them for the names. “La Playa” (The Beach) is atop our fridge (empty) as I write, and there’s an equally enticing one (can’t remember what enticing name, exactly) IN the fridge. 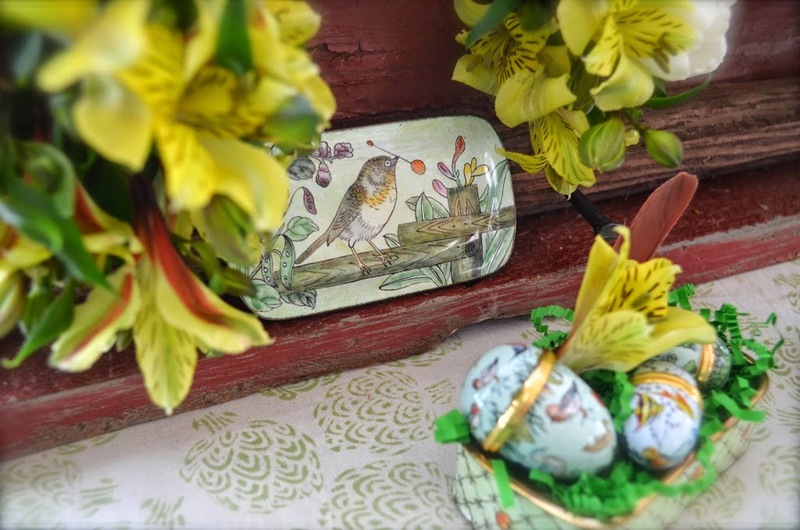 I am nuts about your tablecloth and that gorgeous platter, and I simply have to have the recipe for this tart…it reminds me of the yummy ones now served at Starbucks. Linda: I’m in the process of putting together a cookbook. Do you know what I’m calling it? “The Reluctant Cook.” I love to entertain, but if I could delegate the cooking part to someone else, I would. Therefore, I’m always looking for recipes that look fancy, but are actually easy to do. This tart fits that bill! How beautiful! And, of course, I’m a big fan of Frances Mayes. 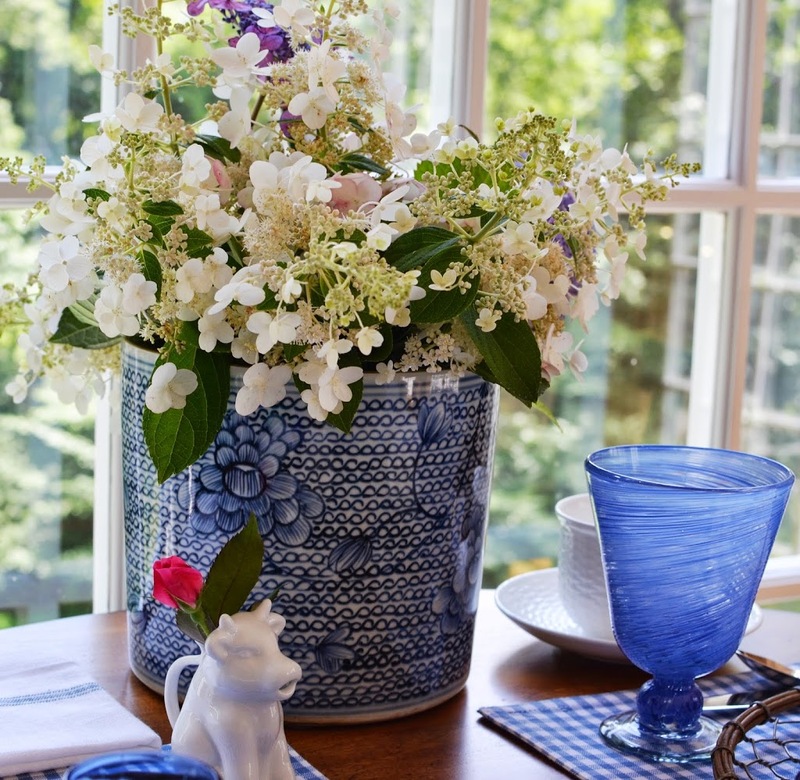 Love, love that tablecloth! 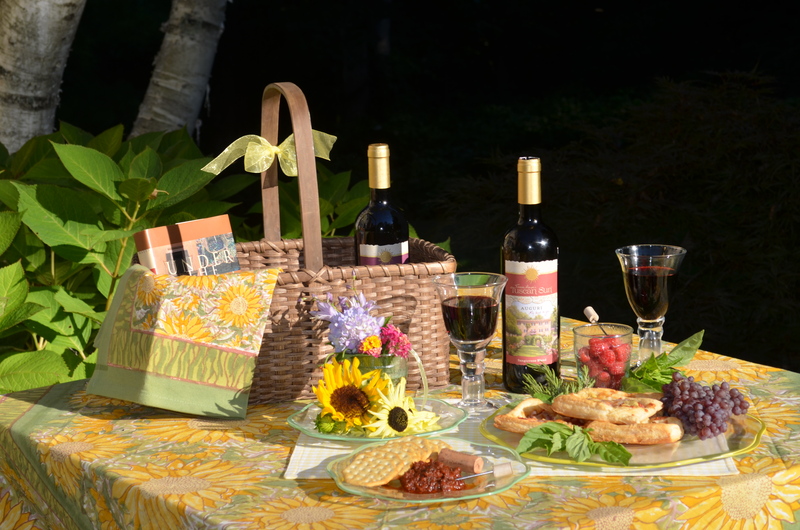 How perfect for a picnic, and for Tuscany! 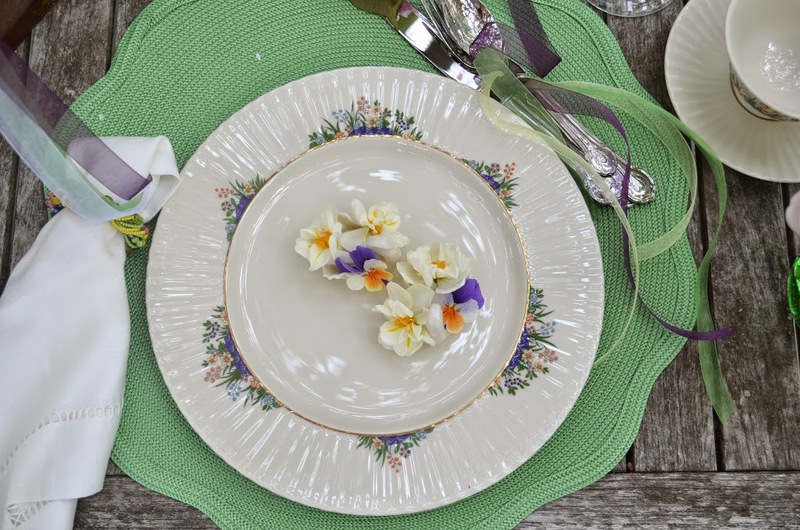 I watched Under the Tuscan Sun last night on Netflix, and your picnic is perfect for the little table in Frances’s garden. Warm sun and earthy aroma would be accompanying it. 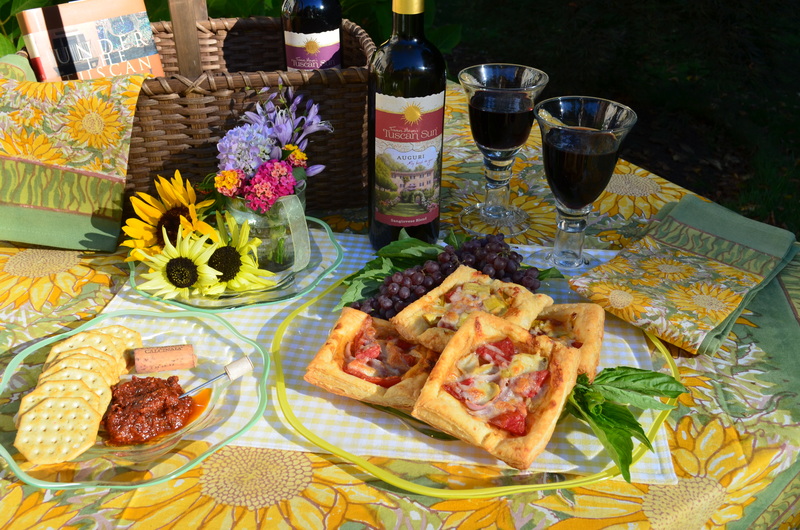 I absolutely LOVE Under the Tuscan Sun and I think your picnic would be beautiful in the garden of Frances’ villa.